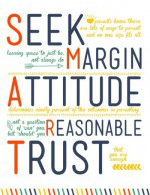 One of my favorite things about Summer is our relaxed schedule. We lose track of time, especially in the long evenings, and start climbing out of the pool about 7:30, only to realize everyone is starving and because I’ve been practicing my cannonballs, dinner hasn’t been started. 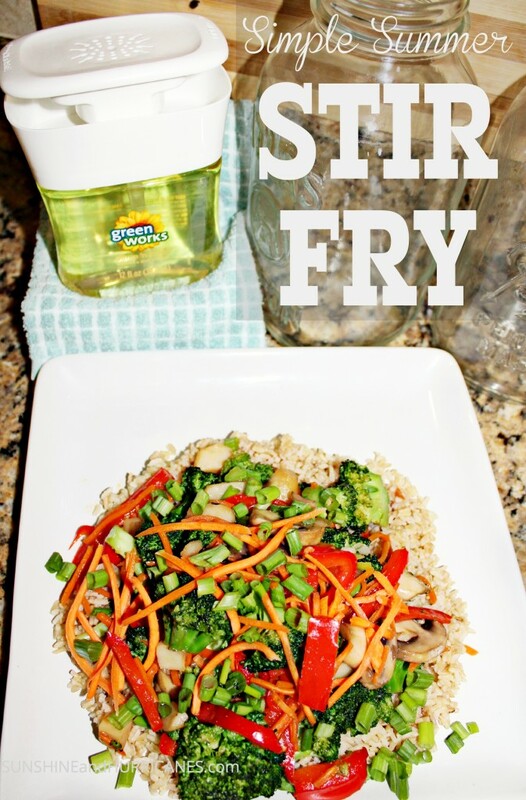 When I need a quick and healthy meal, an easy stir fry fits the bill, and has the added bonus of helping me clean out the refrigerator as well! I grab whatever is on the produce bins of the fridge and start the chopping extravaganza! If you’re lucky enough to have a garden, grab whatever is ripe and throw that in as well! 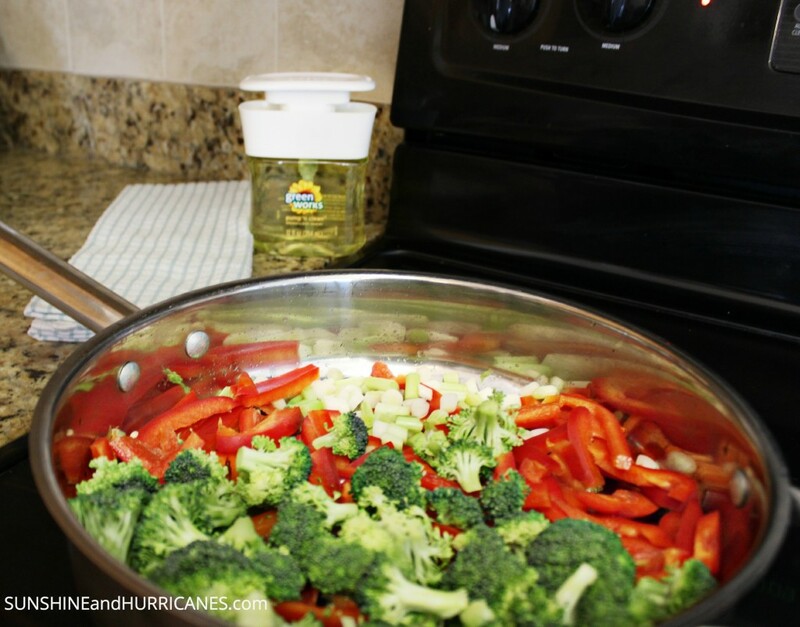 Peppers, mushrooms, broccoli, carrots, and green onion are some of our family favorites. For our family of 6, I use about 5-6 cups of veggies but honestly, I don’t measure, I’m all about throwing it in and starting the cooking, if we have leftovers, great! That’s what makes this a simple meal, neglecting all the recipe rules! Start sauteeing the veggies in a little oil, stir frequently. By now, the kiddos are beginning to reappear after changing out of bathing suits, and I send the littles to set the table and the older ones to begin cleaning up the kitchen from my mad chef adventure. I cook some instant brown rice while the veggies are finishing up and dinner is almost ready! I also have a way to make the kitchen clean up even quicker than this fast meal, I found it while I was wandering through my second home, Target! I spotted this neat looking Clorox Green Works Pump in the green, natural cleaning area. 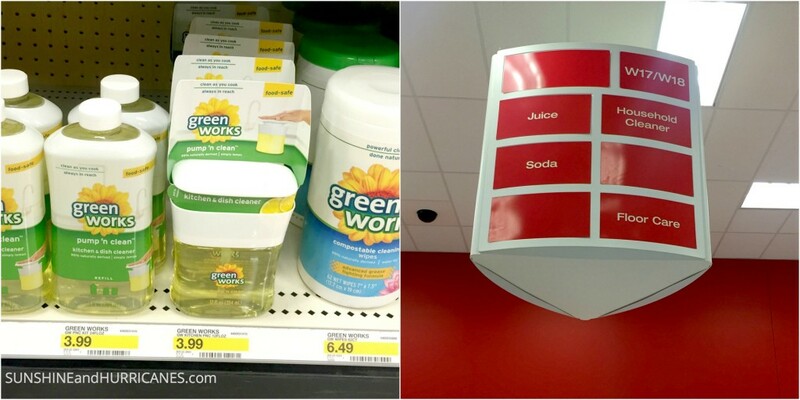 I already use a few of the Green Works products, like the all purpose kitchen cleaner, and Target is the only retailer that carries the entire selection of the Green Works products…just one more reason to visit Target! (I know, like I needed another reason!) 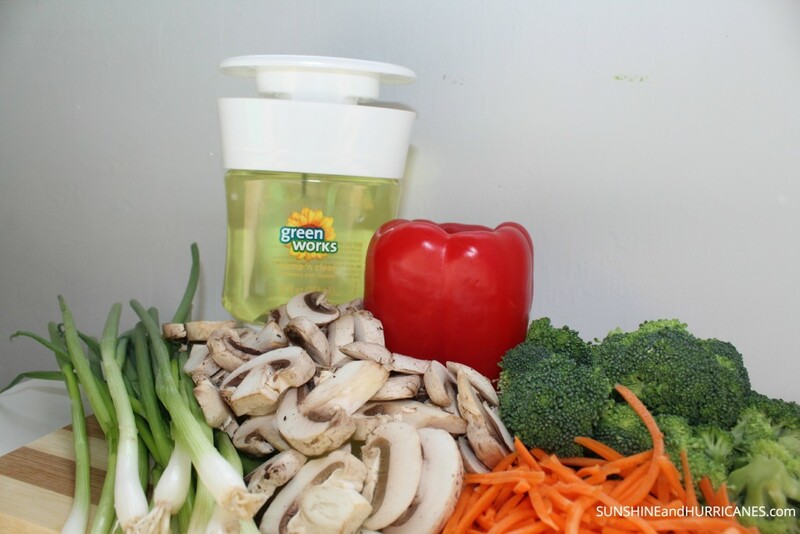 The Green Works Pump is filled with a food safe cleaner that is perfect for wiping up as you go as you’re buzzing around the kitchen. I loved the one handed pump action because I could easily reach across the counter, add the cleaner to my dish cloth, and still keep an eye on the stir fry. The cleaner should not be used to clean up after raw meat/fish but in this recipe, you’re safe! 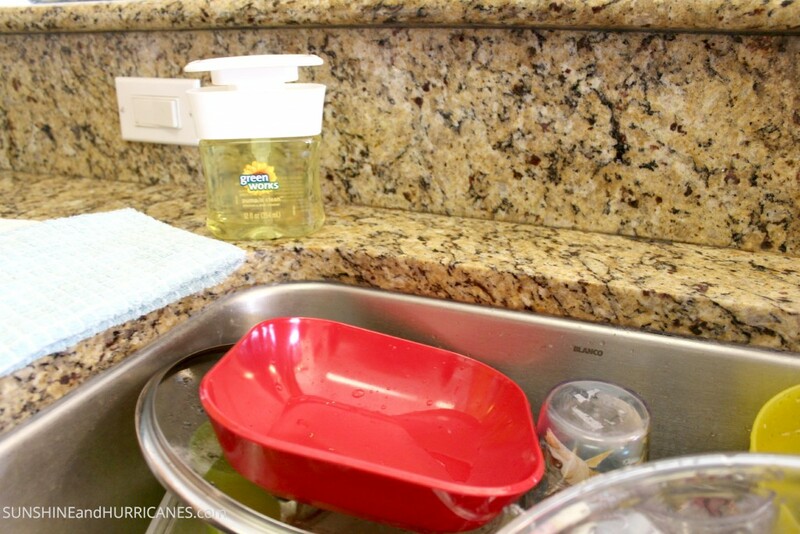 So even though there’s no genie in the bottle of the Green Works that will magically wash those dishes for you, it is an amazing product that I feel safe letting my kiddos use when they complete their daily chores! And from June 14-July 11, use the Target Cartwheel app to save 10% on all varieties of Green Works products (including Pump ‘N Clean). 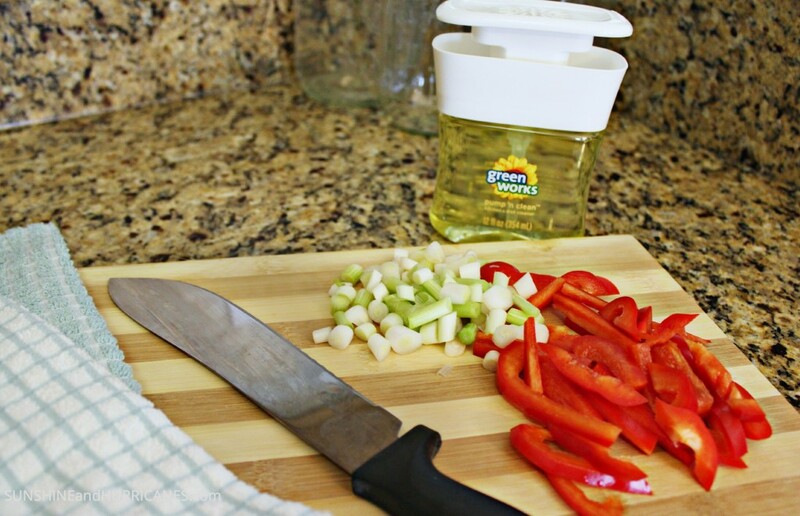 Saving money, safely cleaning the kitchen, and an easy meal? Yes, some days are just that AWESOME! OK…YUM! This looks so fabulous. Nothing beats a great summer stir fry! Loving how colorful the final plate looks. 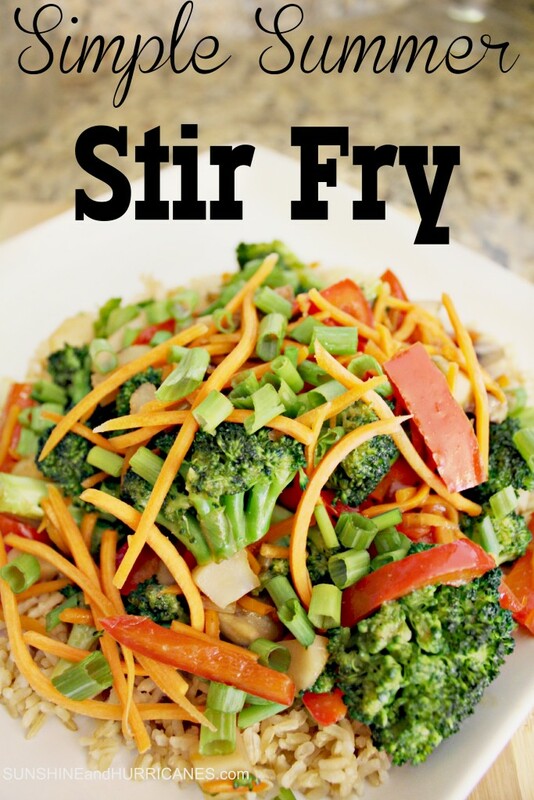 I love stir fry, super easy and super fast. We love asian food in general. That stir Fry looks delicious and it came together so quickly! I will definitely be adding this to my meal rotation. Looks yummy! If only my kids would eat this! Pinned & stumbled! This looks so good. I totally understand what you mean about losing track of time in the summer. This looks bright, lite and delicious! This looks delicious. Now I know what to serve for dinner tonight! I always forget how easy stir fry is to make! I need to whip some up this week! !